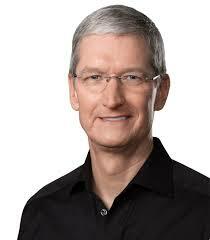 Day 88: Tim Cook, Apple Inc. Lately tempers have been flaring over the incendiary legislation being introduced into several state legislatures. They’re referred to as Religious Freedom Bills – something that would be hard not to support given the history of our our earliest immigrants. But if the very freedom that a bill provides establishes a lawful way to discriminate against a certain part of our population, then we fail in creating a society based upon the immortal declaration that Thomas Jefferson so carefully instilled into our history. We strip our history of the progress made in civil rights – we might as well be having this conversation 55 years ago at the Woolworth’s lunch counter in Greensboro, NC. Tim Cook, CEO of Apple, wrote an excellent opinion piece for the Washington Post where he offered a different lens in which to view this discussion. I encourage you to read it and trust that it will provoke you to “think different” about this situation – after all that is Apple’s motto. Your open letter to the Washington Post was outstanding. I was extremely impressed by the way you talked about the debate over “religious freedom” legislation. You did something brilliant in the letter – you changed the story from one about politics and religion to one about a more universal value about how we treat our brothers and sisters in our community. Skilled leaders do just that – change the narrative to one that allows a greater audience to see a subject more clearly. P.S. Good luck with that watch! 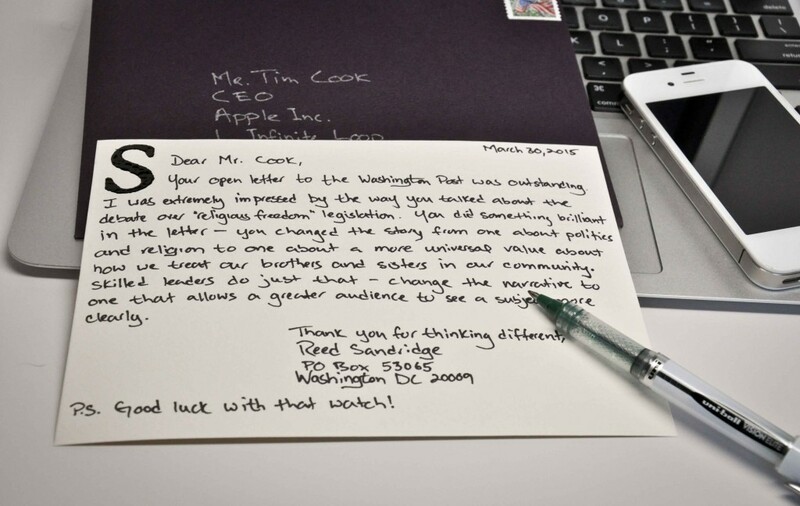 This entry was posted in Just because and tagged Apple, CEOs, civil rights, controversy, debate, discrimination, freedom, handwritten letters, legislation, politics, principles, religion, Tim Cook. Bookmark the permalink.